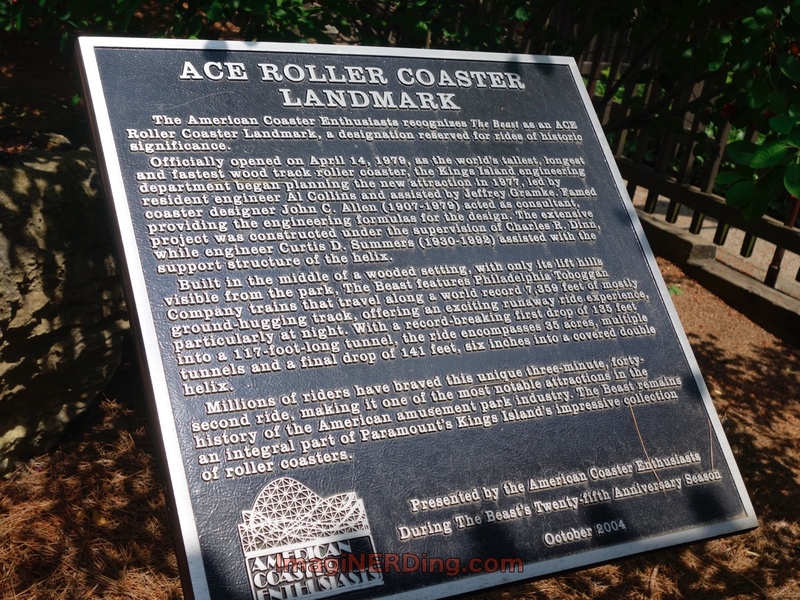 The Kings Island roller coasters were the original topic for this article. As I was writing it, I realized that Kings island meant so much more to me because of my history visiting as a child. I grew up in Cincinnati, Ohio, and my family would visit Kings Island annually. We lived 30 minutes away, but still only visited the amusement park once or twice a season. We moved to North Carolina when I was twelve, just as I was starting to ride roller coasters. As far as I can remember, my first roller coaster was The Bat. I don’t think I ever rode The Racer and I know I didn’t ride The Beast. 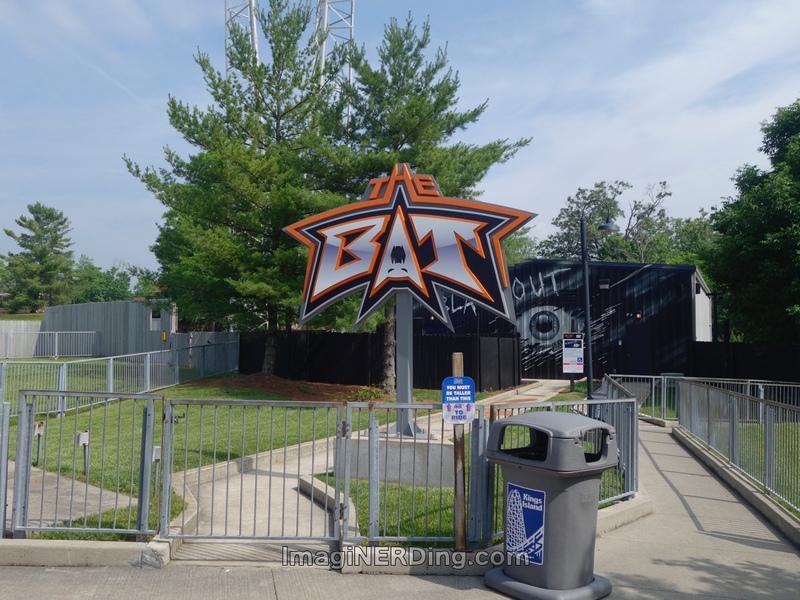 The Bat, a short-lived suspended coaster, debuted before The Big Bad Wolf at Kings Dominion. It’s not the same one in the park, right now. My mother was a huge fan of roller coasters. I remember sitting at the midway at Kings Island and waiting with my dad, brother and aunt while she rode The Racer. It seemed to take forever and I imagined that The Racer was a 30 minute ride. She also rode The Beast with my younger brother, but at 10, I was still not ready for it. 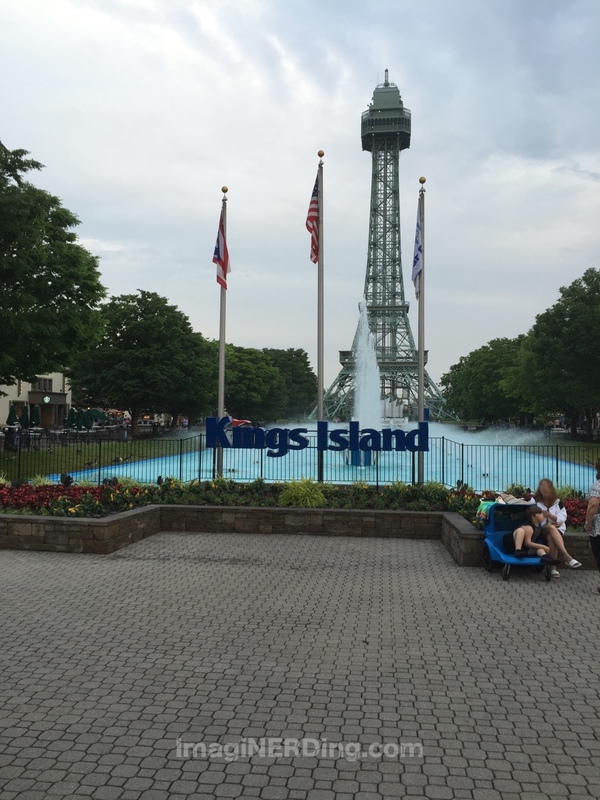 After 30 years, I made the return trip to Kings Island. I was going to ride as many coasters and soak in as much of the park as I could. Would things look different? What would I remember? How has it changed? But we’re really here to talk about the Kings Island roller coasters! Kings Island boasts 14 roller coasters. Sadly, I only go to experience five. A couple were similar to other coasters and a few were last on my list, so-to-speak, and I just ran out of time for some of them. Missing The Beast had always been a big regret. I was too afraid to ride it when I was around eleven and I didn’t really understand wooden coasters until recently. Plus, when you speak with someone in ACE (American Coaster Enthusiasts), their eyes sort of glaze over when they talk about The Beast. Until they find out that you haven’t ridden it, and then they just urge you to do it. Designated as the world’s tallest, fastest and longest wooden roller coaster in 1979, it thrilled riders worldwide. 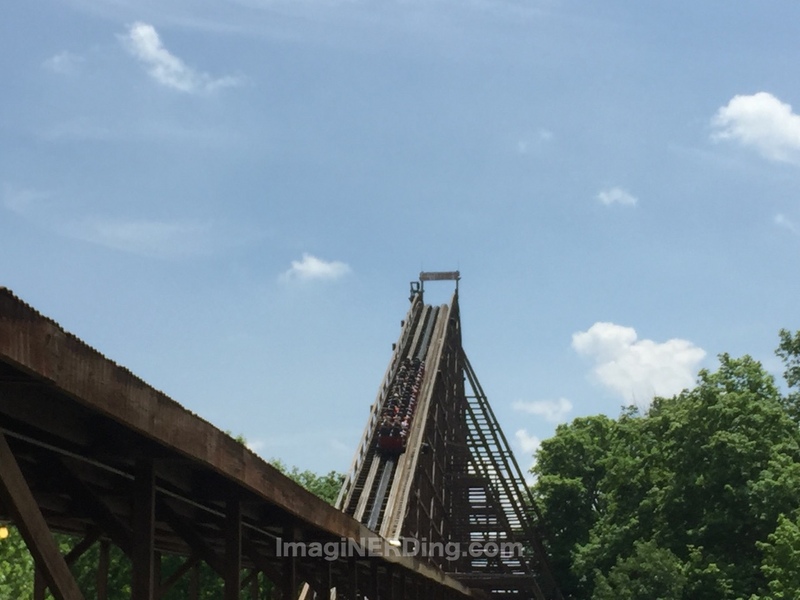 It’s still the world’s longest wooden coaster. Kings Island designed and constructed most of the Beast in-house. The Beast grabs you and never lets go. I’d heard it was pretty powerful, but I wasn’t sure what to expect. 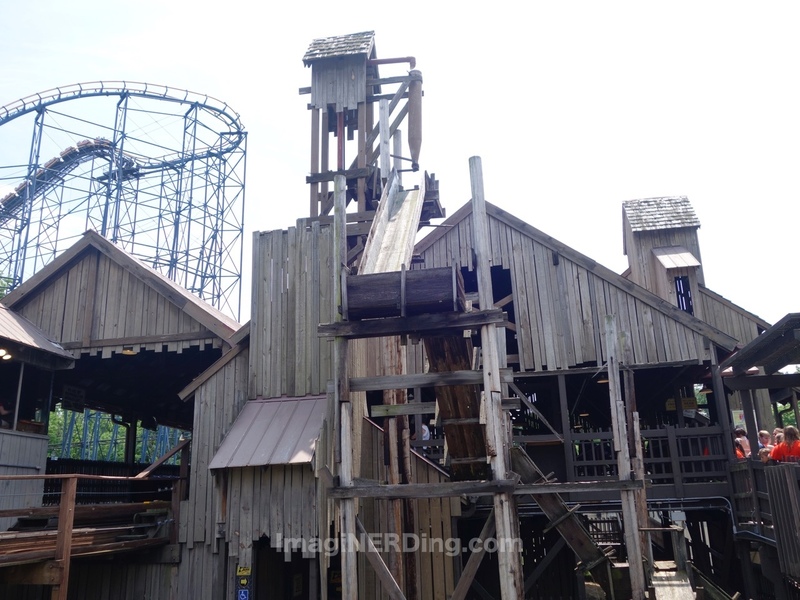 My favorite wooden coasters were Thunder Head (Dollywood) and White Lightnin’ (Fun Spot) until I rode The Beast. Thunderhead and White Lightnon’ were built by Great Coasters International (GCI). GCI, a spinoff from Custom Coasters International, was a company created by the lead designer of The Beast. The Beast queue building with The Vortex in the background. I rode The Beast three times in the evening, including a night ride just after the fireworks. I rode near the front, as I do on most coasters, and it was incredible. Easily, The Beast is my favorite wooden coaster and is in my top five coasters. It actually feels like you’re riding two different coasters. There were moments that The Beast did things that didn’t seem possible for a wooden roller coaster. 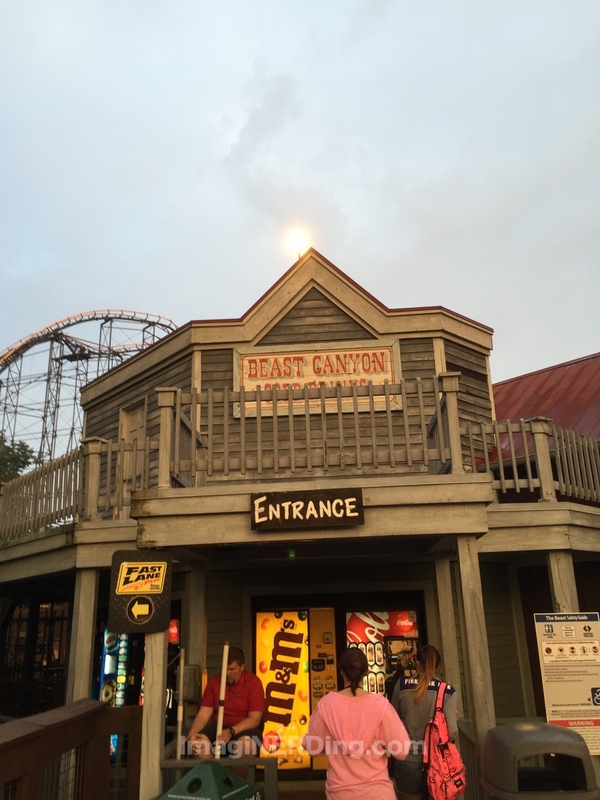 The Beast is an ACE Roller Coaster Landmark! Diamondback is a Bolliger & Mabillard hyper coaster (meaning its taller than 200 feet and there are no loops). It debuted in 2009 and was the first coaster to have a splashdown. Diamondback surprised me because it is gentler than Intimidator (at Carowinds) and has some great airtime. 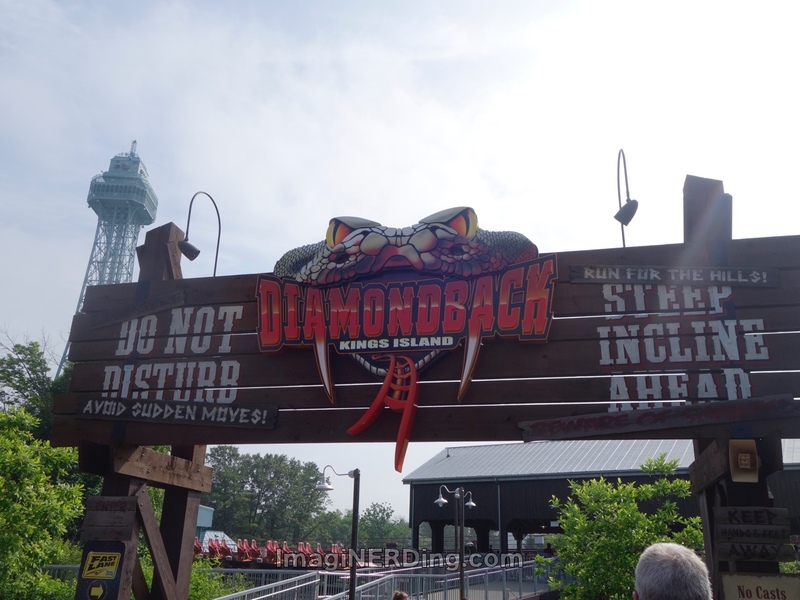 I rode Diamondback for the first time in the evening, and talk about bugs hitting your face! But I survived. Diamondback is also pretty surprising in that it’s a much longer coaster than you expect or see. A lot of Diamondback is hidden, a rarity for a modern steel coaster. It also adds to the surprise. Bolliger & Mabillard coasters are true works of art. Diamondback has some beautiful curves. Diamondback is still a great coaster. It has all of the signature B&M moments and sits firmly between Apollo’s Chariot and Intimidator. This was a coaster I was able to enjoy a second time. There is a lot of airtime on this fantastic coaster. I’m a huge Bolliger & Mabillard (B&M) fan. They are building the most impressive coasters and they continue to innovate and push the limits. Inverted coasters have always caused me to feel a little dizzy after. Alpengeist at Busch Gardens Williamsburg is a great suspended coaster, but it still left my brain spinning for a few minutes. 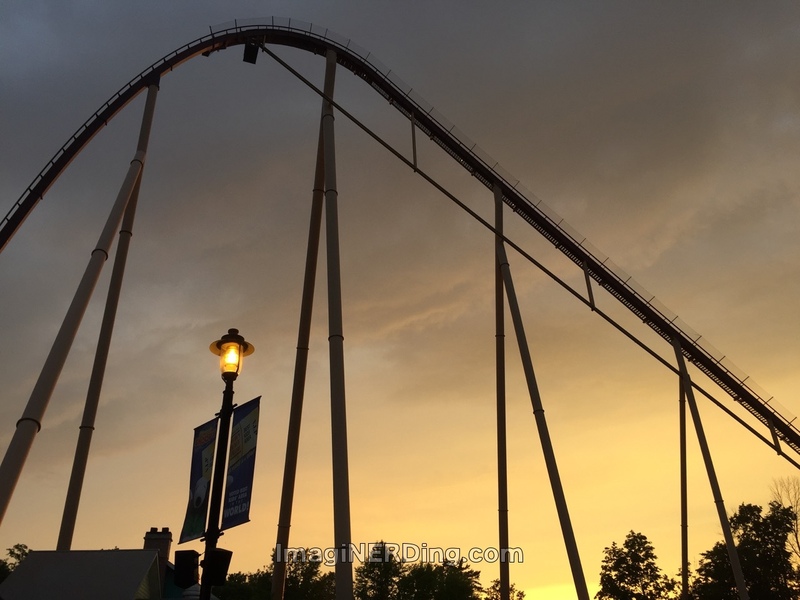 Afterburn (at Carowinds) is an easier suspended coaster. It’s got a very small footprint, which makes it almost too tight. But, we’re here to talk about Banshee. Banshee opened in 2014 as the world’s longest inverted coaster at 4,124 feet. The level of theming around and throughout the queue surprised me. You don’t see theming in thrill parks very often. Make sure to notice the scream of the Banshee from the queue and while the car climbs the first lift hill. The coaster had a level of intensity, but it also played out its strengths throughout the entire ride. 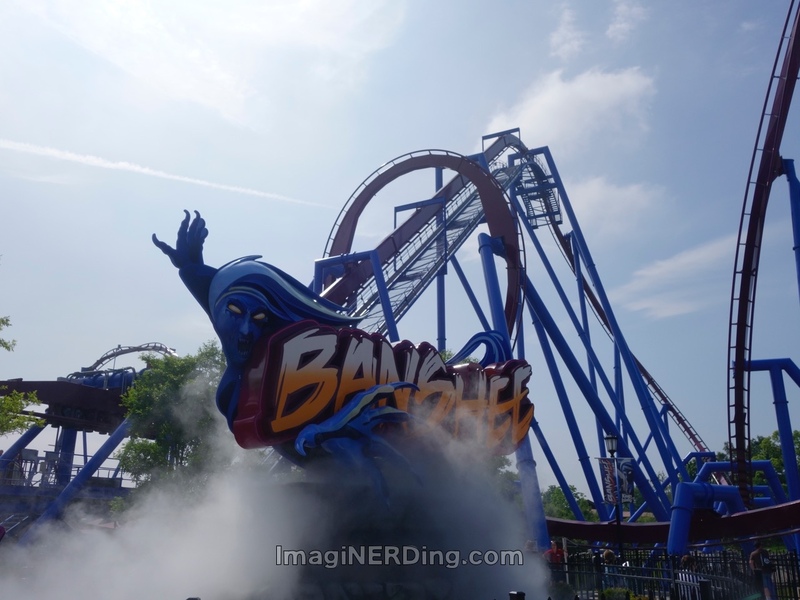 Banshee includes so many great features that have become hallmarks, including: a dive loop, a pretzel roll, an inline twist and a few more. It’s a great experience and is my second favorite coaster at Kings Island. It’s also my favorite inverted coaster. So, I did ride the original Bat in 1983. 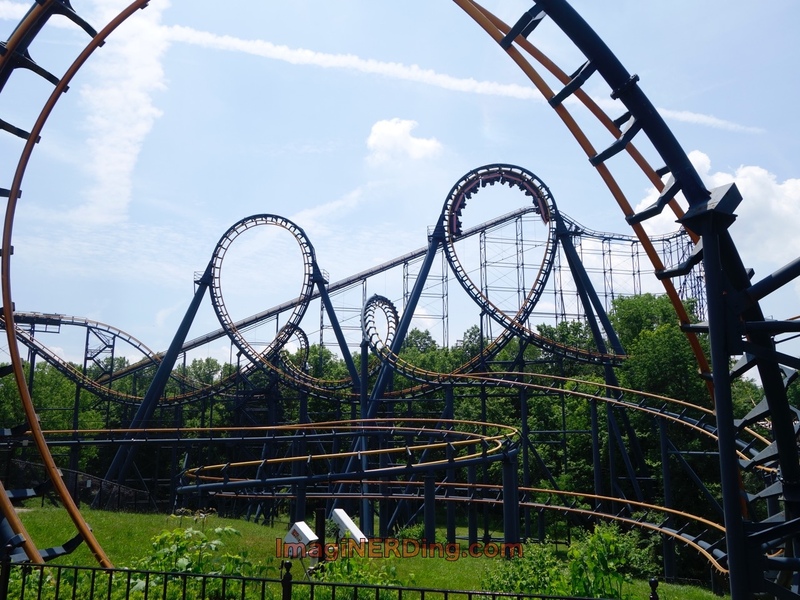 It was the world’s first suspended roller coaster and preceded the Big Bad Wolf (Busch Gardens Williamsburg). The Bat closed at the end of the 1983 season due to mechanical difficulties and track stress. The current coaster opened in 1993. Arrow Dynamics built The Bat; it was Kings Island’s second suspended coaster. Originally known as Top Gun, it was renamed Flight Deck in 2008 (when Cedar Fair bought Kings Island from Paramount). The station was originally designed to emulate an aircraft carrier to go along with the film. It does have an interesting feel to it and felt like it was in the middle of nowhere. It is an Arrow Coaster, which means it’s a fairly rough ride, especially if you’re taller than 5′ 8″ or so. It was a fairly jerky ride and flies through a heavily wooded area. The environment was gorgeous and it was pretty cool to fly through the trees. But, I had to keep my head against the headrest to keep from banging my ears. This might come across as a weird statement, but I really enjoyed the queue much more than the actual ride. 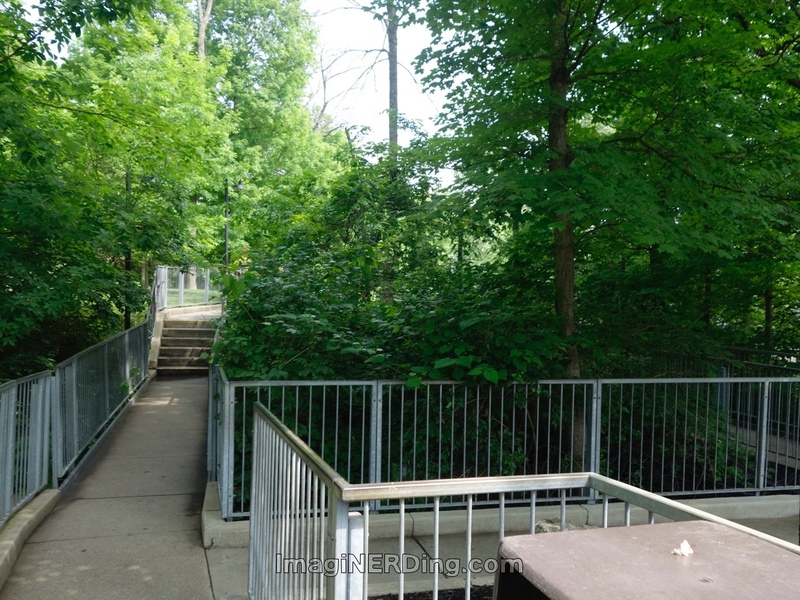 The overgrowth of the trees and plants made me feel like I was heading out of a thrill park and into something different. It was a very long queue but the shade was very welcome. Everyone should experience a suspended coaster at least once, but I’ll skip it on my next visit. Memories flooded pretty quickly when I first entered the Coney Island area; it was a direct memory from my childhood. The sounds and sights triggered fond memories and I remembered spending time here enjoying The Monster and Shake, Rattle and Roll while waiting for my mom. Sometimes we just sat with my dad and watched people as we waited. Seeing the queue structure was one of those moments. The Racer is one of the coasters that kicked of the roller coaster revolution of the 1970s. ACE designated The Racer an ACE Landmark. Due to my mom’s love of The Racer, it holds a special place in my heart. 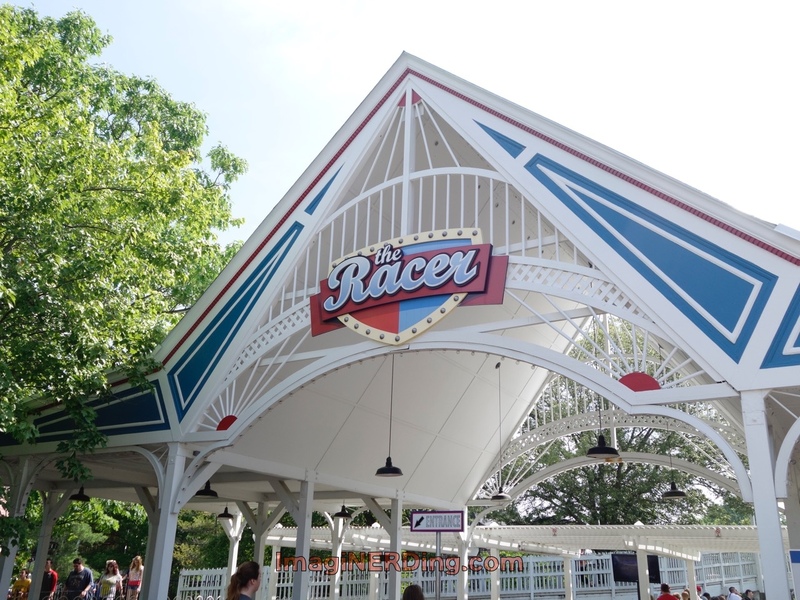 The Racer’s debut in 1972 caused a fever across the world and many parks would build wood and steel creations. I’d ridden Thunder Road (Carowinds) and Rebel Yell (Kings Dominion), so I’ve experienced the triumvirate of 1970s wooden coasters. All three are very similar, but they each have their strengths and foibles. The Racer looked like it needed a little work as I approached. Rebel Yell looked like it was in better shape, but The Racer was a much better ride. I never enjoyed the older wooden coasters because they shook so much that the ride wasn’t enjoyable. Grizzly (Kings Dominion) and The Hurler (Carowinds and Kings Dominion) need a lot of attention. The Racer still had a lot of excitement and it was obvious that it’s been maintained over the years. 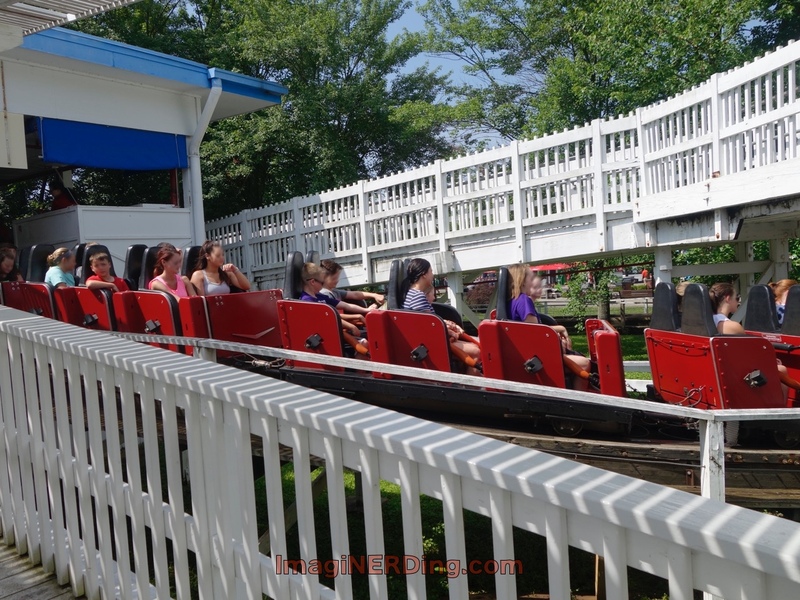 Experiencing this classic wooden coaster is a must! 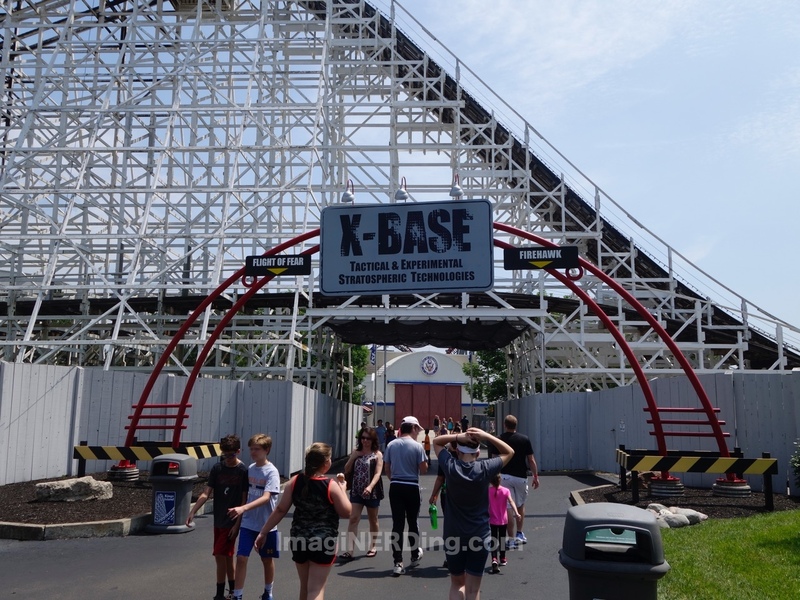 As I mentioned earlier, I didn’t get a chance to experience the other coasters of Kings Island, but I wanted to mention them. Many of the coasters would be painful, which is reason to skip it. I’ve also ridden a version at another park. To me, experiencing coasters I did, along with enjoying the park, was more important than getting all of the coasters done. I’ve ridden the Woodstock Express at Carowinds and it’s a similar figure-eight wooden coaster. Most grownups will need to sit by themselves, though. 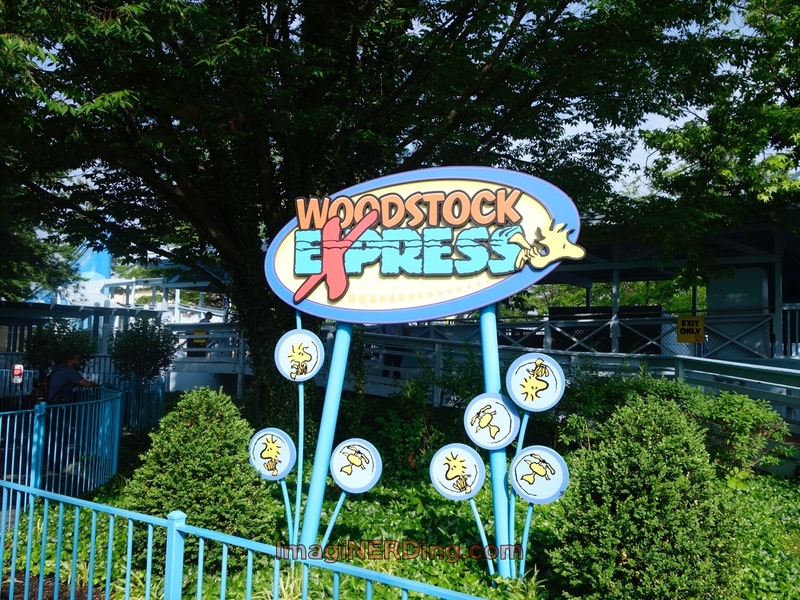 Designed by the famous John C. Allen in 1972, the Woodstock Express is a must-do! I simply ran out of time for these two coasters, although I’ve ridden Nighthawk at Carowinds, which is similar to Firehawk. You actually pass through The Racer, which offers a great experience. 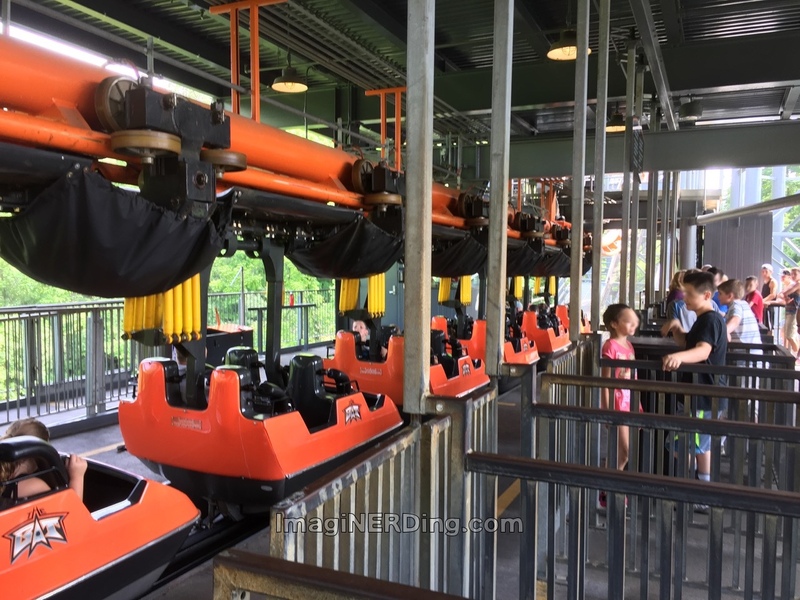 Flight of Fear is a Premier Rides steel coaster and was one of the first to offer a linear induction motor launch. Flight of Fear is an enclosed coaster, like Space Mountain and Rock and Roller Coaster. 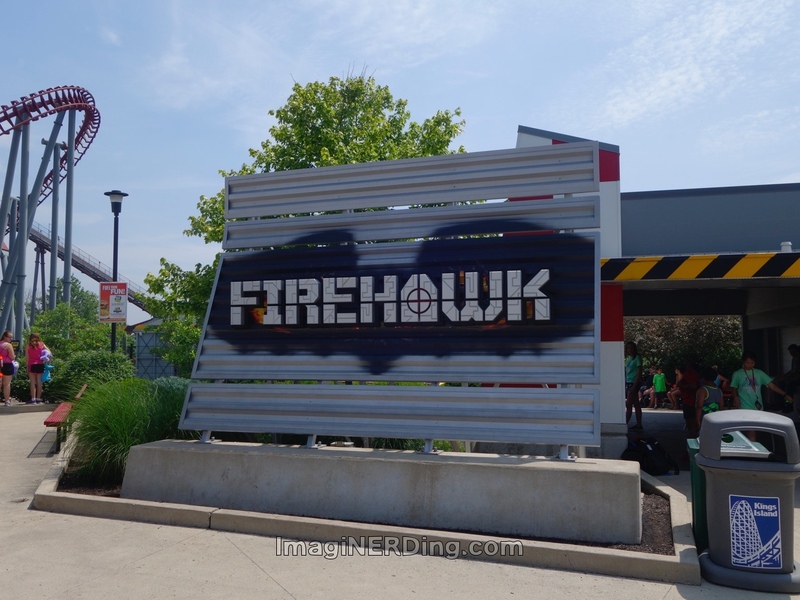 Firehawk opened in 2007 at Kings Island. Previously, it was X-Flight at Six Flags Worlds of Adventure. It is a steel flying coaster built by Vekoma. 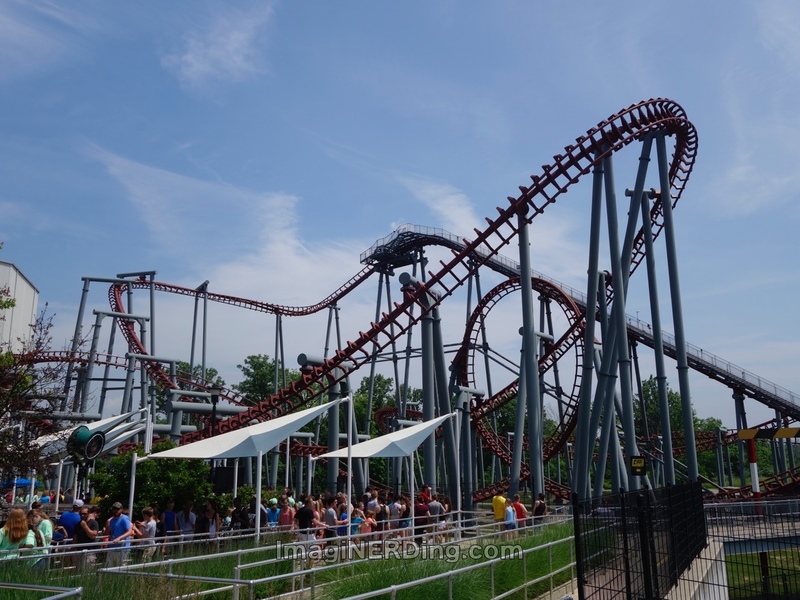 Firehawk does have a dual-load station, which is better than the single load at Carowinds. Based on time, and experience with Nighthawk, this coaster was also not that important to do. I’ve done a flying coaster by B&M and it was so much better. 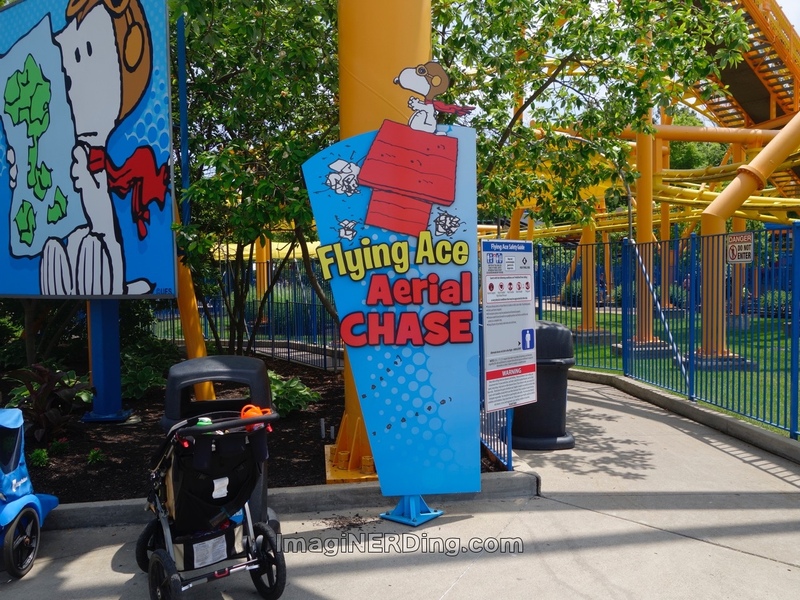 Flying Ace Aerial Chase is a suspended family roller coaster by Vekoma. An identical one was built at Carowinds. It opened at Kings Island in 2001 (as Rugrats Runaway Reptar). It’s a short ride at 1:30 and is often a kid’s first experience with a steel coaster. Being a Vekoma, it’s pretty painful, especially if you’re over 5′ 8″. You can see most of the ride from the Planet Snoopy area, so kids can get a good look at it. The Vortex opened in 1987. It’s an Arrow Dynamics looping coaster with six inversions. The coolest thing about the ride is that it uses the same queue and ride station as The Bat (1982-1984). 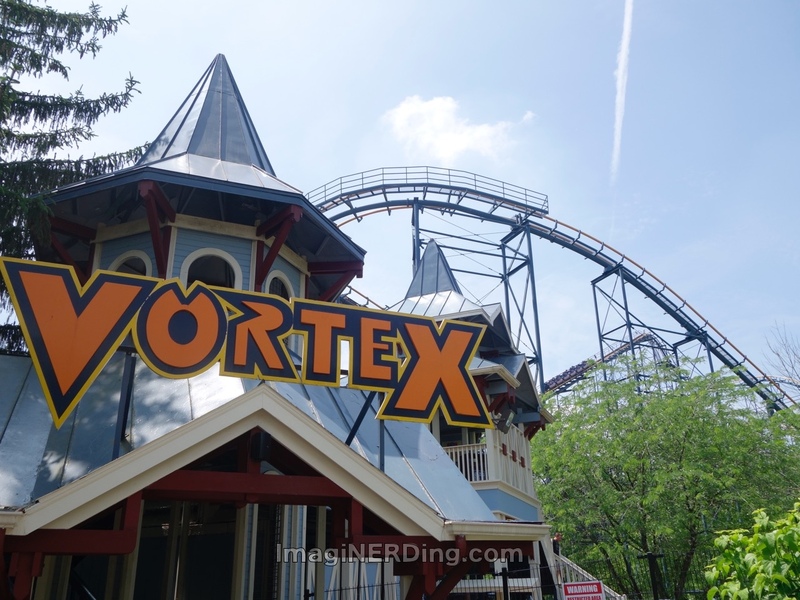 The Vortex does offer some great coaster watching spots along the pathway out of the Coney Mall section towards Riverton. It had to be an impressive view back in the late 1980s. Still, with all of my experiences on Arrow looping coasters, I wasn’t up to the back-breaking coaster. Maybe next time. For some strange reason, I never even got close enough to Invertigo to get a photo of the Vekoma shuttle-style coaster. 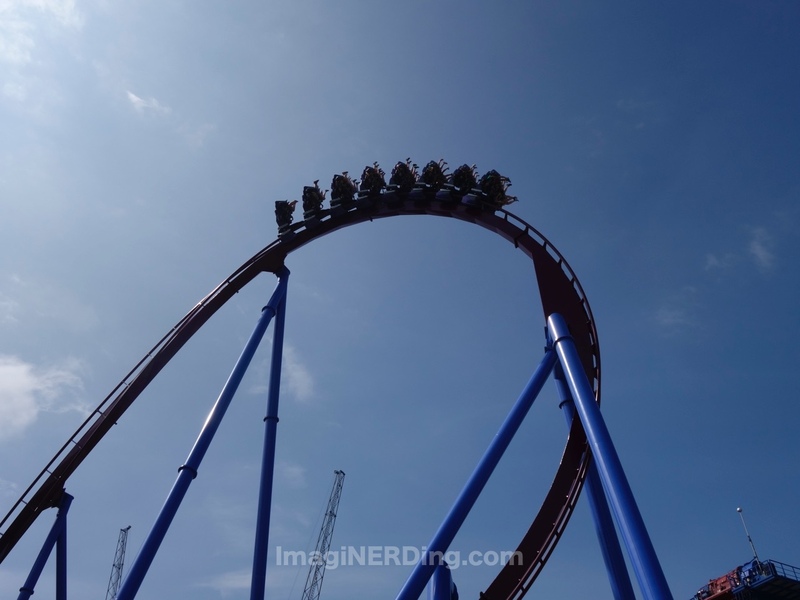 This version is inverted (Carolina Cobra at Carowinds has traditional seating) and the riders sit face-to-face. Based on my experiences with Carolina Cobra and other Vekoma coasters, it was last on my list. Invertigo opened in 1999. I rode the Backlot Stunt Coaster at Kings Dominion, so this coaster was low on my list. Backlot Stunt Coaster is a steel-launched coaster built by Premier Rides. It debuted in 2005. It’s a fun little coaster with a few surprises. Definitely worth checking out, here or at Kings Dominion or Canada’s Wonderland. I went by Adventure Express twice to ride it and it was down both times. It’s an Arrow Dynamics mine train coaster built in 1991. It was themed heavily to Raiders of the Lost Ark and is one of the few Arrow coasters to have a heavily-themed area. And there were no loops, so I expected an update of Carolina Goldrusher (at Carowinds) and Dahlonega Mine Train (at Six Flags over Georgia). Next time, Kings island! So, even thought I missed more than half of the coasters at Kings Island, I was still able to hit the very best ones and still enjoy the park. I made sure to ride The Monster and the train. I also ate Skyline Chili in the park and had the blue ice cream. But, I rode Diamondback twice and The Beast four times. The Beast is such a spectacular wooden roller coaster that I was eager to pay it more attention than many of the other coasters. Oh, and Dinosaurs Alive at Kings Island is better than all the others! What’s Your favorite of the Kings Island Roller Coasters? My favorite part of the theming for the Banshee is the eternal flame left behind in honor of the Son of Beast. Just a nice touch imo. 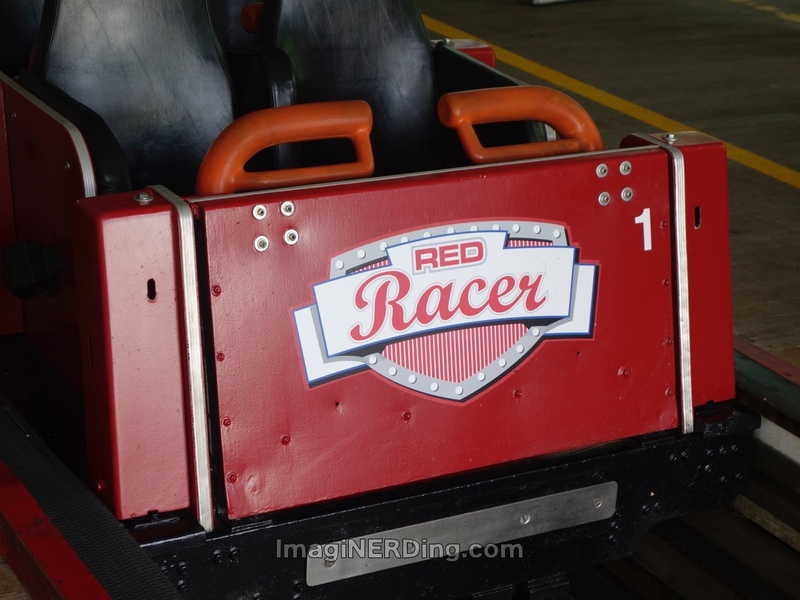 They really have done some work getting the racers back up to par, but I do miss the red racer running backwards. It was a unique twist on the racing concept that was a fun, unique experience to KI.